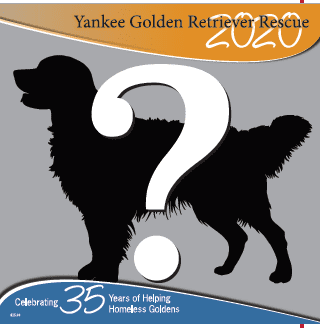 Submit your 2020 YGRR calendar photos - Yankee Golden Retriever Rescue, Inc.
We are now accepting submissions for the 2020 YGRR calendar! Goldens must be YGRR Goldens. 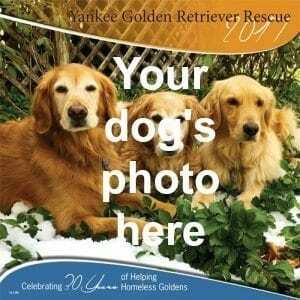 Will your YGRR Golden be our cover model? If your Golden was featured in the 2019 calendar, we cannot accept another photo of your Golden until we are ready for the 2021 calendar. Eligibility is every other year. Deadline is April 1, 2019. We accept both digital and original photos, however we prefer DIGITAL photos, as they can be easily edited by our designer. To qualify, your digital photo must be at least 145 dpi resolution at 12″ by 12″; and must be in focus (no blurring or pixilation) when viewed at 100%. The digital file size should be no less than 1.08MB (1,300KB). As much as we love all of the photos we receive, please understand that if your photo does not meet these requirements, we may not be able to consider your entry. E-mail entries to: susan@ygrr.org, mail entries to YGRR Calendar Photos PO Box 808 Hudson, MA 01749. Make sure the date mechanism is turned off. Pictures should be saved and submitted in jpeg (jpg), .gif, or .png formats. The pictures must be high definition (with no blurriness) in order to be enlarged to the 12″ by 12″ format. Review your photos on your computer at the actual pixel size (100%) to confirm that your picture is not blurry. Send the original digital file from your camera. DO NOT CROP YOUR PHOTO! Cropping may prevent it from being enlarged to be reproduced. Our designer can crop your photo to make it the perfect calendar quality. Send the largest file possible once you’ve downloaded them from your phone; the original size works best. Since the individual photo files will be very large, please send only one file per email.